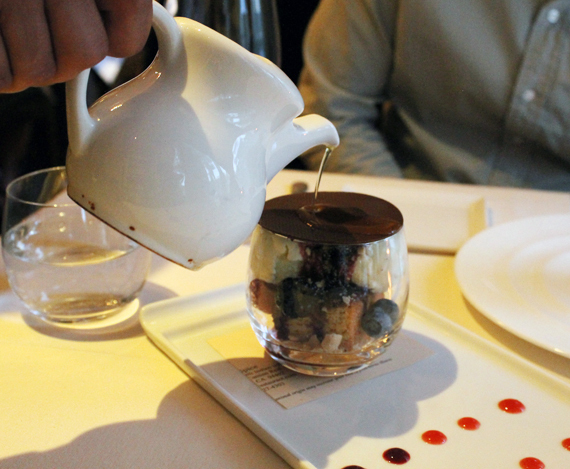 The signature “Snowglobe” dessert at All Spice. What happens to a restaurant after it receives a coveted Michelin star for the first time? It gets busy, busy, busy. 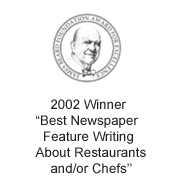 Such is the case with the charming All Spice in San Mateo, which opened in 2010, and was awarded a Michelin star in 2012. 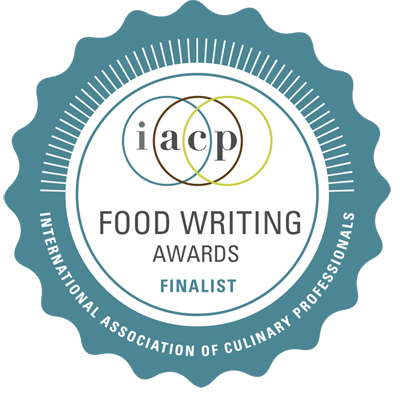 The award is proudly displayed in the foyer of the 1906 Victorian that houses the restaurant. The first time I visited the restaurant a few months after it opened, there were a few empty seats here and there in the cozy dining rooms. Now, the place is packed, as evidenced by a recent visit last month, when I was invited in as a guest of the restaurant. Chef Sachin Chopra, who cut his chops at Amber India in San Jose and Daniel in New York, conceived of All Spice as a tribute to modern Indian cuisine. In the past few years, he’s fine-tuned his vision even more. All Spice has never been about blow-out-your palate spiciness. It’s always been far more subtle. It’s more so now. 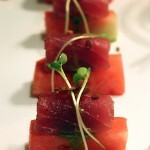 The fine-dining approach is evident in the artistry of the presentations. The techniques evoke French classicism. The flavors are Californian with measured accents of Indian. Also new to the restaurant is the Wolff & Father Loup de Rouge on the wine list. A blend of Zinfandel and Merlot, it was made by Chopra’s wife and co-owner, Shoshana Wolff, who has a master’s in Viticulture and Enology from the University of California at Davis, and her father, who owns a vineyard in the Santa Cruz Mountains. It’s got gentle tannins, along with notes of dark cherries, cranberries, spice and bramble. Japanese beer to start the meal. 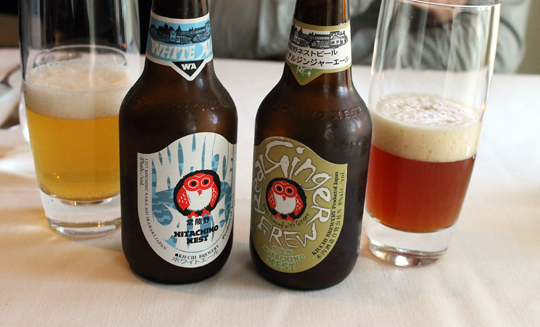 My husband opted for the Hitachino Nest White Ale, a favorite among chefs. I countered with the Hitachino Nest Ginger Brew. Yes, actual alcoholic ginger beer rather than ginger soda. It was refreshing, but being the ginger addict that I am, I wish the heat of the rhizome was more pronounced. 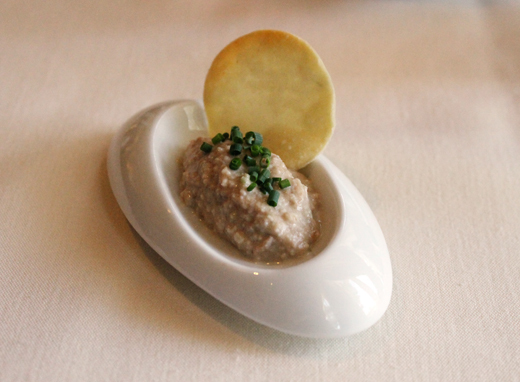 The amuse that night was a duck confit puree with a loose, creamy texture to be scooped up in the accompanying tiny cracker. Duck confit puree amuse bouche. Chilled English pea soup ($9) was poured at the table, its lovely green color filling the bowl that held a yogurt gelee and a bit of aleppo pepper. Velvety and sweet as spring, it was ravishing. 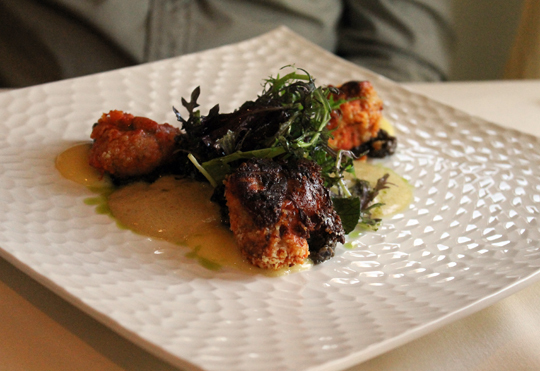 Next, tandori-spiced sweetbreads ($17) that dusted in ginger, turmeric and cumin. Crunchy on the outside and fluffy within, they were complimented with a bright lemon sabayon. Sweetbreads coated with warm tandori spices. 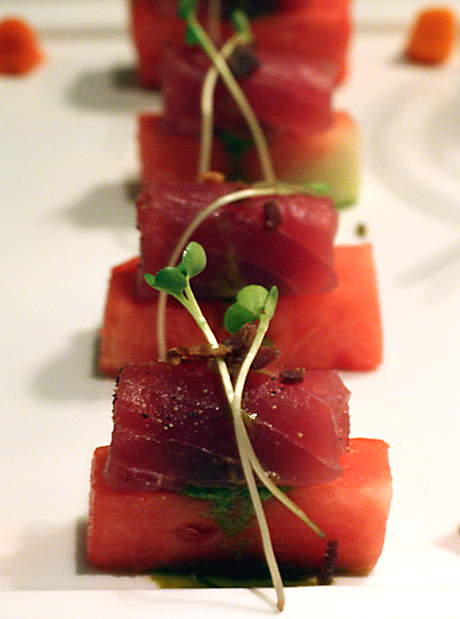 Tuna tataki ($15) was beautiful to behold. 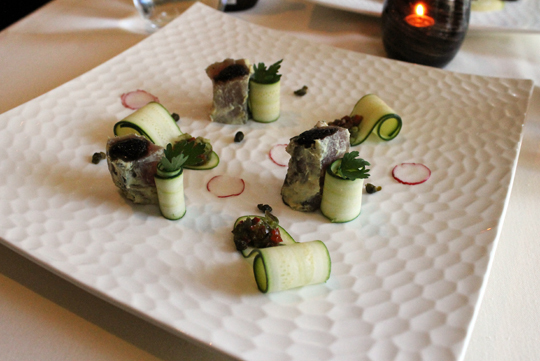 Thin, strand of zucchini were rolled up and arranged on a honeycombed plate with batons of tuna standing at attention. The tuna was brushed with mustard to add a sharpness to its natural richness, then briefly charred. Small puddles of caviar and a scattering of capers added brininess. A special that night was a riff on duck a la orange. Here, the breast was finished with blood orange sauce. 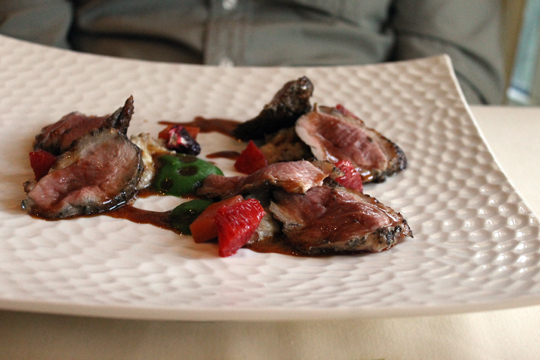 The confit leg meat was mixed into the risotto hidden underneath for a real treat. Sea bass with a creamy smoked trout sauce. 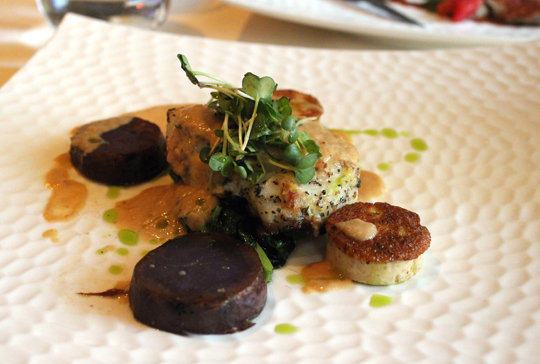 The snowy white, flaky flesh of seabass ($30) was fragrant with lemongrass and a creamy sauce made with smoked trout. Purple and white potato rounds were arranged just so on the plate with coins of shrimp mousse. 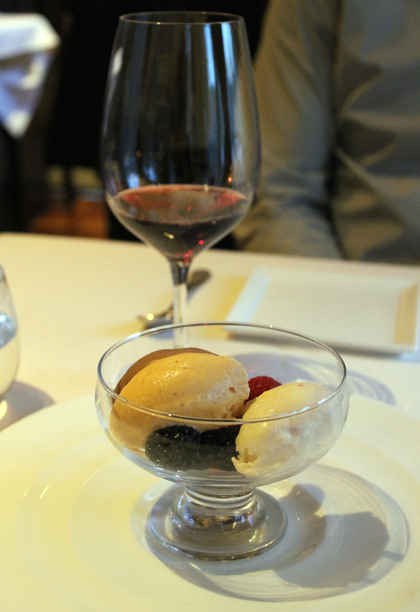 For dessert, there’s the signature “Snowglobe” ($9). A goblet comes to the table holding cubes of buttery, rosemary cake and scoops of chocolate chip ice cream. A thin chocolate disk covers the top, awaiting the arrival of the server, who pours warm olive oil over it, dissolving the chocolate and bathing everything below with lushness. Ice creams ($7 for two scoops) are all house-made. Chopra likes playing around with flavors, mixing chocolate with rosemary to great effect. That night, there was even a brown butter corn ice cream. It tastes like corn on the cob, slathered all over with rich, nutty butter. The crowds have definitely found All Spice now. If you haven’t yet, it’s about time you did. Delicious looking food! The sweetbreads look tempting. I’m so happy for them. They definitely upped their game and the menu looks so much more sophisticated. Bravo! Such refine looking dishes. 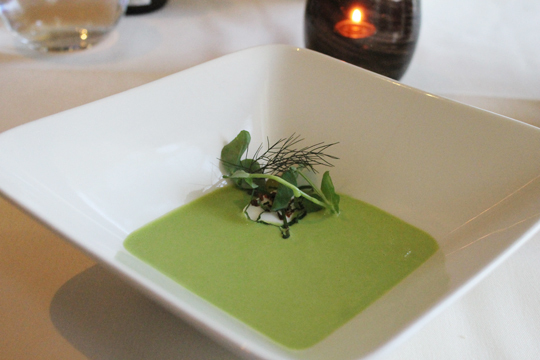 The chilled pea soup looks perfect for the current weather, and I’d love to try that duck ala orange! When I grow up I want to be you and get to visit all of these great restaurants! 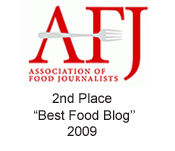 😉 Great looking food, and a super review – thanks. I love an interactive dessert. So fun! And I love the labels on the beer!